Laminated heavy card with writeable area for pupil's name. 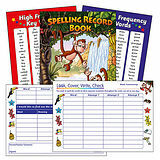 Space to collect 16mm square stickers on the reverse, ideal for storing spelling rewards. Also available as sinlge cards or in packs of 50 and 100 cards. 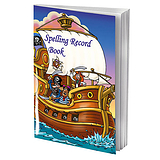 Use with our pirate themed Spelling Record Books to help your pupils develop great methods of learning spellings.